NOTE TO MOBILE USERS: To best enjoy these travel photos, you may need to rotate your phone to view the site. 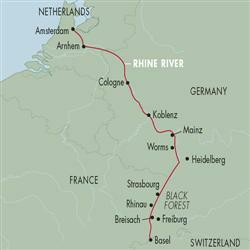 In 2006 we took a Rhine River Cruise from Amsterdam, down the Rhine River in Germany, ending up in Basel, Switzerland, with a stop in Strasbourg, France along the way. We chose a new travel company this year, INTRAV, and we felt they were very good. We started our tour in scenic Amsterdam where we had a little time to explore. Our first day on the river (actually a canal at this point) took us to the eastern end of the Netherlands to the town of Arnhem, then we crossed into Germany and formally started cruising up the Rhine River. Yes, up: the Rhine flows toward the North Sea, so we were going up, against the current, even though we were headed southward. There were several locks along the way. Here, then, are some highlights from our tour. If you want further information on any particular picture, hold your cursor over the picture and a brief explanation should appear. Amsterdam is a wonderfully scenic city, filled with narrow buildings and canals and lots of bicycles. (It is said that the national pastime is stealing bicycles.) Amsterdam, the capital city, is in the province of North Holland (which is where we get the name Holland), which is part of the Kingdom of the Netherlands. The word Dutch means the Netherlands or its people. The house where Anne Frank hid during WWII is in Amsterdam, as is the Rembrandt museum. The homes are especially interesting, as they are very narrow, all about the same height, but each with a unique "top." At the peak, there is often a timber supporting a pulley, which was used to transport merchandise to the upper floors, and it can still be used to raise furniture. No trip to Amsterdam is complete without a ride into the countryside to see the windmills and cheese farms and/or wooden shoe factories. Yes, many people, especially farmers, still wear wooden shoes. The farmers shoes, curiously, are painted white. Then it was off for the eastern end of the Netherlands and the city of Arnhem. Along the way we saw many commercial boats transporting merchandise (sand and coal, for example) and we went through several locks, finally passing from the canal into the Rhine river itself. In Arnhem, we visited the Oosterbeek War Cemetery to pay our respect to the dead. It was clear from the stories the guide told how significant this cemetery was to the soldiers and families of many nations. The September 1944 story of Operation Market Garden was told in the movie, "A Bridge Too Far." American, Polish, and British soldiers tried to parachute into Holland behind enemy lines to capture a key bridge at Arnhem. It was their bad luck to parachute into a division of German soldiers on leave. We also visited the Kröller-Müller museum, dominated by original van Gogh paintings, bought for a song before he became famous. And we learned that it is just about impossible for us to pronounce "van Gogh" the way the Dutch do! That "gh" gets really gutteral! The museum is surrounded by an elaborate sculpture garden. As we passed from the Amsterdam-Rhine Canal into the Rhine itself, our first city destination was Cologne; and in Cologne, it's all about the twin-spired cathedral. We arrived in light rain and (as was typical of the mornings in our trip) cloudy weather. Our first view on land of the cathedral was from across the river. Our last view (second picture) was as we pulled away on our boat under much improved weather conditions. A somewhat more modern church is in the foreground. Here we see a gold shrine behind the alter, which reportedly contains the bones of the Magi (3 Kings). 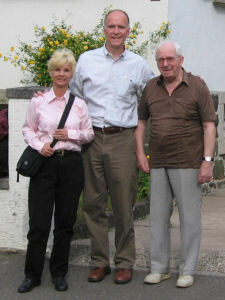 Now it was time to begin cruising the Rhine (Rhein) in earnest. At first the countryside was low and flat, but as we progressed, the hills and mountains appeared. The really scenic portion (castles) of the Rhine runs from Koblenz to Bingen, where the river turns East and we stopped at Mainz. Here are some photos (mostly in order) from our cruise up the Rhine. Again, you can hold your cursor over the photo to get an explanation. For more information, see Castles on the Rhine (description) and Map of Castles on the Rhine. We constantly saw commercial ships. Some of them contained dozens of containers, such as you see at right below at the container loading dock. Manufacturers load their product into "containers" which are transported from port to port (often overseas) intact. At this point, we began to see the castles. Some were in ruins, some restored, and some used commercially as hotels, and some held as private residences. Sometimes it's hard to tell castles from elaborate estates built with castle-like features. Below right notice the bicyclist on the low path, a train track in the middle, and a car passing on the highway above. Atop the rock is a private estate, not a castle. This is wine country. You've heard of Rhine wines? The vineyards are steep, often extending up behind a village or roads and a train track. Riesling is the predominate grape, but there are others. Now the following picture (left) deserves its own explanation. This is a single building: A church (in the center) connected to a bar (on the left). The guide told us that the priest is also the bartender! I guess one way or another, he, ah, serves his parishioners! And here are the burg's (castle's) Maus (left, built in 1353) and Katz (cat, built later that century), just before reaching the Loreley. The picture below left is the famous Loreley, a narrow point at the river where the river curves sharply and presents a challenge to navigation.